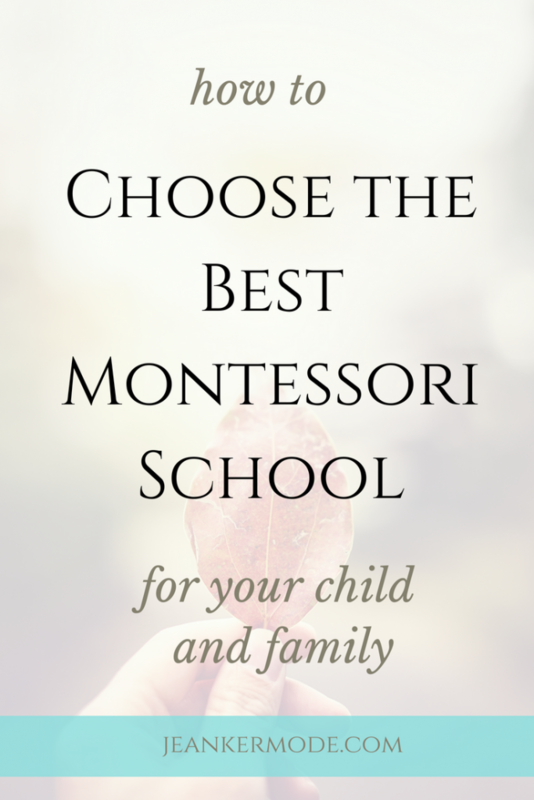 Are you wondering how to choose a good Montessori school? I can help. Plus, get your free, printable checklist detailing what I look for in the best Montessori schools. There are a lot of Montessori schools out there. And you want to find the best one for your child and your family. You want to find a school that will nurture your child and work with you as a parent, and that you can afford. But you’re busy! Between work, errands, keeping the house together, and chasing your very cute rascals around, you don’t exactly have time to sit down and sift through all those school websites. Let me research the schools in your area, compile the details, and help you choose the best school for your family. Basically, I’ll do all the nitty-gritty, time-consuming research and comparisons. Then I’ll recommend your best options. Then you get to pick. Imagine finding the best school for your child, without having to spend hours scrolling through websites. Imagine knowing that your child is receiving the best Montessori education in your area, without having to wonder if the school is authentic or not. other pertinent details such as size, number of classrooms, etc. I’ll give you all of this information in a simple, straightforward chart, and I will assign each school a ranking based on my research. With this information, you’ll be able to quickly see which school best fits your family’s needs and your hopes for your child. You’ll be able to easily schedule a visit to your top options. You’ll be able to start the application process right away. Most importantly, you’ll rest assured that, of all the Montessori schools and preschools in your area, you’re choosing the best for your child. Let me quickly introduce myself. My name is Jean Marie. I am so passionate about education, especially early childhood education, and especially Montessori education. I have a Master’s degree in Montessori education and a Primary Montessori diploma, issued by the Association Montessori Internationale. I’ve also worked in several different preschools and Montessori schools. I’ve studied what works, and I’ve seen what works. …especially in those first few years, when your child is forming his character and making memories that will influence him for the rest of his life. Get me to do all the tedious work for you, give my recommendations for the best quality Montessori school in your area, and still let you make the final choice for your child. I do believe that you, as a parent, know your child best. Only you can choose what school she attends. I also believe that I can help you to make this choice without pulling all your hair out. You sign up for a free call, with no obligation to buy. We’ll chat about what you’re looking for for your child. Then, when you’re ready, you can purchase my Best Montessori School package. As soon as you make the purchase, I’ll get started researching schools, and you’ll get back to the rest of your life. I can’t wait to help you choose the very best school for your child.